This is about marmalade. Real, Seville orange, Oxford-style dark amber marmalade. The reason to get up on Sunday morning. The reason why toast was invented. A substance so compelling that passing the jam aisle is impossible without a glance; do they have it? Up here in Vermont, the answer is, usually not. The supply runs out, and then what? There are no easy answers. However, if one can find some Seville oranges, as I did recently, then the problem is solved. They have a brief season in January, and top-notch markets sometimes stock them. 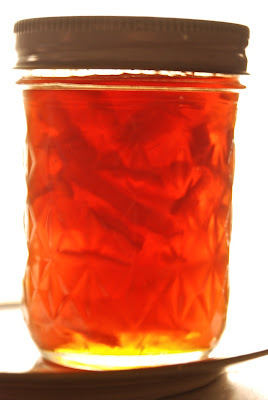 A 4-lb sack of the lumpy, unattractive Sevilles will yield many jars of dark, slightly bitter, Oxford-style marmalade. All it takes is sugar, patience and canning jars. 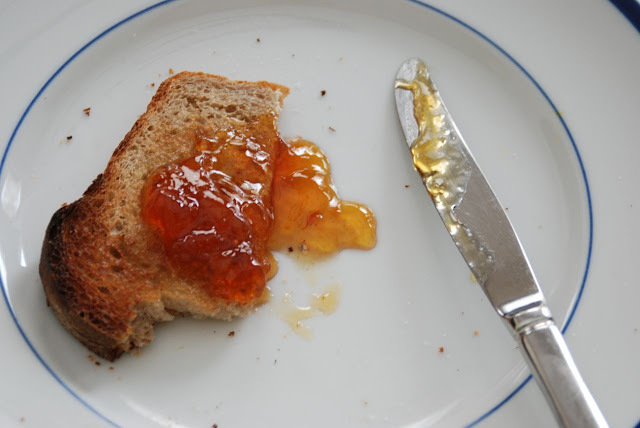 Technically, a marmalade is a heavy jelly with suspended bits of peel in it. (If you are interested, there is quite a lot of material online about the history of various favorite British brands, and how they have fallen victim to cost reduction measures and corner-cutting. ) The type I'll describe is the cooked-orange method, which avoids the difficult task of removing the peel. A long wooden spoon for stirring. A ladle or large spoon for pouring the hot marmalade into jars. 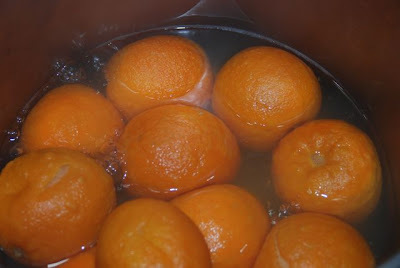 Wash the oranges in hot water to remove any wax or oil that may have been applied. Place them in the cooking pot, whole. Place on the stove with lid on, and apply heat. Cook gently for 2 hours or until tender. Allow the pot to cool down until you can handle the oranges. They should still be Hot. Cut each orange in half, and gently remove the seeds to a small bowl. You are going to use the seeds in a moment, do not throw them away. 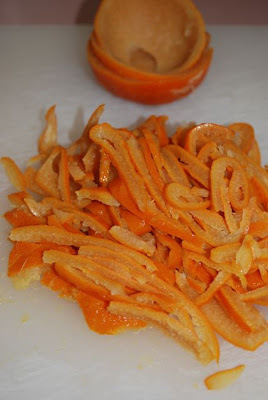 Scoop out the pulp to a bowl, it will be very soft and easy to remove from the orange peel. Tie the pulp into a coarsely-woven cheesecloth, using kitchen string. This packet will be cooked further with the jam and eventually squeezed out. 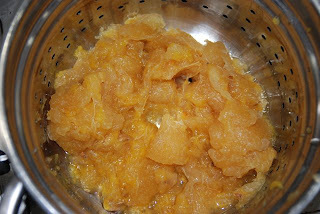 If you prefer to leave the pulp in the finished marmalade, just put it straight back in the pot. 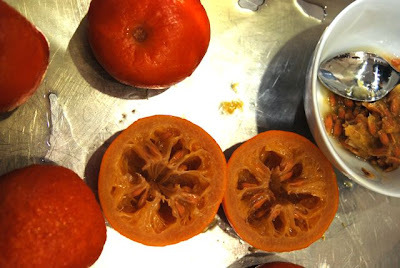 Cut off the stem ends of the orange halves, and slice the peel into slivers, coarsely, perhaps 1/8" to 1/4" thick. 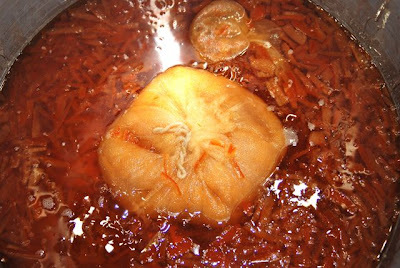 The seeds are necessary as they provide the the bitter taste that makes Oxford Marmalade so special. Take a small square of cheesecloth and tie them tightly into it. Place the pulp bundle, peel slivers, and seed bundle back into the poaching water. If the water has diminished significantly, add more water at this point. Otherwise you will end up with too much peel for the amount of finished jam. On the other hand, too much water will prevent the jam from setting. Bring it all to a gentle boil, stirring occasionally right down to the bottom of the pot to prevent burning. This may go on for several hours until the marmalade is ready. You will know when it is getting there because it becomes a beautiful dark amber. To check the set, splash a bit of the marmalade onto a cold plate, leave for a few minutes and see if it sets. If it doesn't, continue cooking. When ready, turn off the heat and press all the juice and pectin out of the two cheesecloth bundles. Discard these. Stir once more. Ladle the mix into hot jam jars. Screw down the tops as soon as each jar is full (leaving a small air gap). Process 20 min. covered in boiling water. Allow the jars to cool overnight. Put them away in a cool, dark, dry, safe place.